.NET Framework is important for running applications developed under .Net platform. 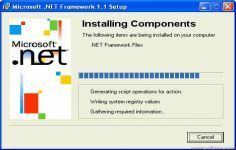 Essential for the functioning of many software .NET Framework allows to run applications developed with the Microsoft.NET platform. In practice, the framework is used by many software. .NET Framework offers among others a better support for multicore processors and increased performance, optimizing data access, support for SDK 2.0 Surface, Multi-touch Windows 7 menus tape and other additional features associated with the taskbar. .NET Framework provides increased scalability and applications through improved caching, deploying and updating applications via ClickOnce, support the largest number of browsers and devices performance possible via the ASP.NET controls and services.